When I started writing this blog almost a year ago, I did so because I was determined to remake a large portion of my life. Writing on a regular basis was the first step. Now I’ve taken the second step, a much larger step: I’ve left my job of almost 20 years. I have been officially retired (and unemployed) for 10 days. We laughed and chatted a few minutes and then went our separate ways. As I got in my car to head to lunch, I realized that I was feeling quite unsettled and it had to do with that business of making a list. I am one of those people who likes to have a plan, likes to be organized and likes to see the fruits of my labors. In other words, I like to put my to-do’s/want to-do’s on paper and then mark them off when I’m done. This is how I have handled all the years of juggling home, job, church, volunteering, etc. We are a busy society and I know I am not the only “list fanatic” out there. Yet, one thing I have griped about for the last couple of years is how scheduled and structured my life has been. In my mind, remaking my life was going to be throwing all those lists to the wind. She who is not known for being the queen of spontaneity was going to become such overnight. Well that was pretty foolish thinking on my part. It has not taken me long to realize that my grandmother was right all those years ago when she told me we needed structure and routine in our lives. She was recounting how she managed her life after my grandfather died unexpectedly and early from a heart attack. In spite of her grief and her desire to do everything to the contrary, she made a point of continuing to get up at the same time every morning, getting dressed for the day and having her meals on schedule. I’ve seen the value of this in the lives of friends who have lost their jobs. Suddenly the anchor line has been cut and they are drifting. Clinging to whatever schedule of living they had when employed helps them stay on course. I’ve seen it in people who have returned home after serving time in prison. The schedule they lived under provided some semblance of stability. Freedom, so greatly desired while serving time, becomes a major stumbling block upon release. And how many of us have known young people – maybe this includes you – who enlisted in the military because they needed structure and discipline in their lives? While I don’t have the next year of my life all planned out, I do have some goals I’ll be working toward. Having a sense of purpose is critically important to our well-being as humans. 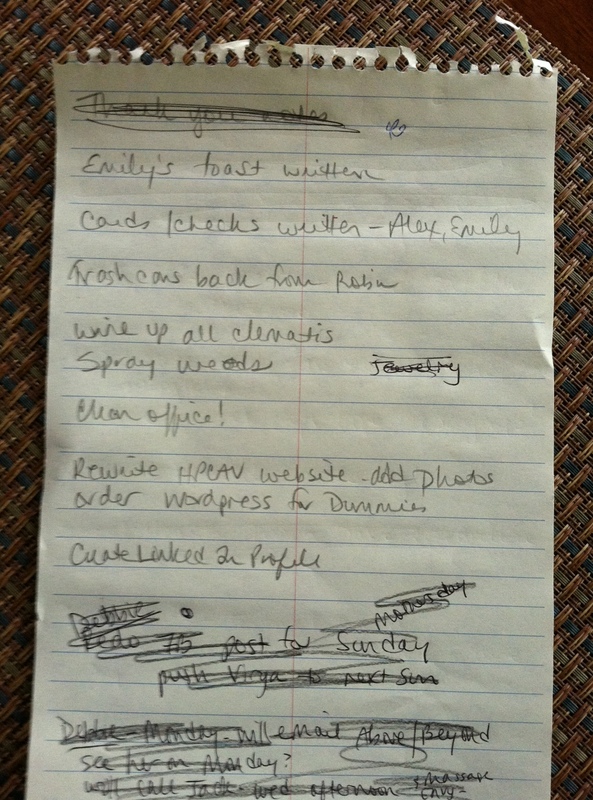 When I got home after my luncheon last week, I made a to-do list. It’s not real long or detailed, but it’s my anchor for the next week or two as I continue working on this remake. My life is certainly different and yet, there is at least one part of it that will be the same: the list. What I am interested in seeing – I feel like a spectator here – is what happens to this blog. While the focus of my posts has always been on the positive side of the craziness of everyday living, I’m not sure where my thoughts and ideas will take me in the weeks to come. I am definitely going to spend some time getting to know some of the incredibly interesting people I know are out there in the WordPress world. I feel sure there will be some new influences that may lead me to make some changes here. Who knows? It’s just part of the remake!